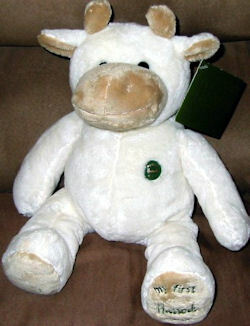 I am searching for a white and tan plush cow from Harrods department store in London. The original was purchased in 2005 and is no longer available from the store. One of the feet is stitched with ”My First Harrods Cow”, and it has a green button on the chest which says the same thing. This is my son’s absolute favorite stuffed animal, and it was accidentally taken to the waste disposal site. He was given this ”My First Cow from Harrod’s” before he was born, and he is now 5 and a half! He has slept with it every single night since then. Recently he was sick to his stomach and ended up throwing up on poor “Mr. Cow”. As we were not at home, Mr.Cow and his bedding were placed in a trash bag, which was ultimately brought to the waste disposal site. We only recently remembered this, and it’s too late to get him back. My son is devastated! As are we… If ANYONE has a ”My First Harrods Cow”, from 2005, PLEASE PLEASE get in contact with us. I have a my first harrods cow that it in great condition that i am willing to sell. Do either of you still have one please? Hannah, we are looking for one for a little boy with leukaemia who recently lost his treasured cow on a family holiday to Eurodisney, and is heartbroken. Are any of these cows still available? I’m desperately in search of one too! (Athena is looking on the same person’s behalf). How much do you want for it, Hannah? I’ve already connected Hannah and Athena via email. Plush Memories paid for an ad on Facebook focusing on England, and we sent out a Newsletter to about 500 people, so yes, not only this country, but England as well is looking!! The lady is giving Jack the cow for free Jackey. I am crying my eyes out reading all the posts on various sites from total strangers trying to make my little boy happy. People can be so unbelievably kind. Thank you! Wow thank you Hannah you are an absolute angel!!!! I have this Harrod’s plush cow in good condition if anyone is still looking for it!